The house system has a special relevance at JBS. The school is divided into four houses PURITY, HONESTY, HARMONY, MODESTY . Each house is an autonomous unit under the care of the house masters assisted by other teachers. It is a structured community within which a child develop the feelings of loyalty, responsibility of living in a family and leadership. 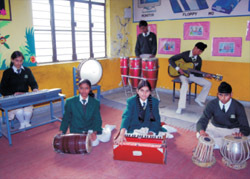 The houses compete in a wide variety of fields like dance, music, debates, quiz, sports tournaments, etc. 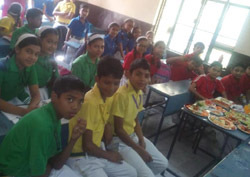 In fact these activities test students and encourage them to exploit their hidden talent. The development of mind and body go hand-in-hand. In short physical education plays a vital role in creating confident individuals. Therefore sports are an integral part of our education system. We have facilities for:- Athletics, Swimming, bandminton, Skating, Basketball, Table Tennis, Cricket, Chess, Gymnastics, Martial arts, Hockey, Soccer, Taekwondo, Yoga, etc. Particular emphasis is laid on music and dance. Indian classical & folk dance, western music & dance and singing are offered to students to develop their skills and musical appreciation. We organize “The Annual Cultural Event” in our school to develop confidence of students to showcase their talent.